In less than a century – 90 years to be exact – the Newark Museum's seven impressive collections have become among the country's best. They are completely the result of private donations, 90 years of incredible fine gifts and bequests. Without this rich storehouse, there would be no reserve to draw upon to educate, excite, entertain and inspire the viewer. In effect, the individual items or collections are building blocks which generations of talented curators use to tell about individuals or society. The 1980s renovation created, for the first time, space for permanent exhibition galleries for each of the pivotal collections. A whole world awaits the viewer in the collections assembled at the museum complex in downtown. The Museum's American Art Department is one of the nation's finest, ranging from the colonial era to today. It's particularly strong in 19th and early 20th century works. Hudson River School landscapes are by Thomas Cole and Frederick Church. Representing 19th century neoclassical sculpture is Hiram Power's Greek Slave. Still life paintings and American impressionists by Mary Cassatt and Child Hassam abound. African-American artists include Henry Cassawa Tanner, Romare Bearden and Jacob Lawrence, and pre-World War artists included Edward Hopper, Robert Henri, John Sloan and Georgia O'Keeffe. One of the Museum's most prized possessions is a series of five panels by Joseph Stella, The Voice of the City of New York. The museum is a major WPA-era print repository and a pioneer in collecting and exhibiting American folk art. The Decorative Arts Department began in 1911 with an important ceramic collection. It now includes exquisite examples of furniture, silver, ceramics, glass jewelry, and textiles, forming a collection of applied art of all countries and all periods. The department's centerpiece is the Ballantine House, a late 19th century Victorian mansion and one of the state's major tourist attractions. The 19th century furniture is one of the finest public collections in the country. It includes a comprehensive range of styles. The pottery collection is one of the best-documented in the country. An extensive collection of New Jersey ceramics reflects the state's historical role in the industry. Extensive holdings range from fine porcelain and English ceramics to Jensen silver, Orrefors glass, Jelliff furniture, and Tiffany jewelry. The Asian Collection includes materials from the major cultures of East and South Asia. It was established in 1911 with the Rockwell Collection of Japanese Art, which makes it one of the nation's major Japanese collections. The collection's Ukiyo-e prints came from Dana's personal collection, and the extraordinary Tibetan art collection is on permanent view with its centerpiece a Buddhist Altar consecrated in 1990 by His Holiness the XIV Dalai Lama. The Chinese collection was built on the efforts of Newark businessman Joseph S. Isidor. The Korean Collection is based upon pottery and porcelain from the 4th to the 17th centuries. The Classical Collection represents the ancient cultures of the Mediterranean world. It has been described as 'one of the few unbroken threads of continuous tradition which link us to the past of Egypt and Rome.' Over 1,000 items date from 1500 B. C. to 1000 A. D.
The comprehensive collection from Africa, the Americas and the Pacific demonstrates Dana's desire to interpret other cultures as broadly as possible. As early as 1928 the first exhibition of African art was accompanied by the education pamphlet 'Africa for Children.' Fine African sculpture from the Yoruba, important holdings of ceramics, baskets and metal arts, and a growing emphasis on African textiles are included. Southwestern Native American pottery and 19th and 20th century textiles are part of the collection. Objects from New Guinea including masks and ceremonial boards, highlight the collections from the Pacific Basin. The Numismatic Collection is a bridge between the fine and decorative arts and includes currency from around the world. The Frank I. Liveright Collection includes 6,500 items. The Natural Science Collections are a significant component of the museum's education activities with holdings in zoology, botany, geology and paleontology. Dr. William Disbrow's founding collection came in 1922, and contained over 74,000 examples of precious stones, minerals, pressed plants and seeds. The Mini Zoo in the new South Wing Education Center contains hundreds of birds, fish, reptiles, marine invertebrates and small animals in habitats similar to their natural environments. In 1989 a cotton-top tamarin monkey was the first primate born in captivity. The mission of the museum of art, science and education will be completed with the creation of new resources for science education. A 5,000-square foot permanent exhibition, Making Sense of the Natural World, is being planned for the Main Building's third floor. Visitors will experience the wonder of nature's diversity through the unparalleled natural science collections. Educational programs for schools, teachers and families that integrate the 70,000 object collection will be featured. The Dreyfuss Planetarium and the Mini Zoo will exhibit the latest in exhibition theory and design, as well as computer-based learning technologies. The new galleries are scheduled to open to the public in 2001. Mary Sue Sweeney Price was named museum director in 1993 after serving as the longtime deputy director to Samuel C. Miller. Immediately, she embarked on a joint trustee-staff Long Range Plan to prepare the museum for the next century. The 1990s have been a period of great optimism in Newark, heralded by a cultural revival marked by the reopening of the Newark Museum and the opening of the New Jersey Performing Arts Center. The Museum exhibition, Crowning Glory: Images of the Virgin in the Arts of Portugal, provided a meaningful cultural encounter for more than 50,000 visitors. Other attention-getting exhibitions included The Glitter and the Gold: Fashioning America's Jewelry (1997), Wrapped in Pride: Ghanaian Kente and African-American Identity (1998); and Off Limits: Rutgers and the Avant Garde, 1957-1963. The 90th anniversary year celebration will conclude with a great Tibetan show. This year, the museum also celebrates the 25th anniversary of the Newark Black Film Festival, the longest running black film festival in the country, and the 25th anniversary of The Newark Volunteers, a dedicated group of more than 200 men and women. 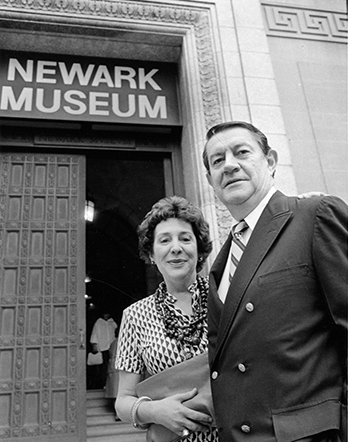 As a leader of Newark's cultural activities, the museum forms an important part of the backbone of what has been called 'The Newark Cultureplex, ' a powerful constituency which includes the Newark Public Library, the New Jersey Historical Society, the New Jersey Symphony Orchestra, Aljira, A Center for Contemporary Art, City Without Walls gallery, Newark Symphony Hall, the Institute of Jazz Studies at Rutgers Dana Library; WBGO Jazz Radio; the Newark Boys Chorus, and the New Jersey Performing Arts Center. Add to this the great higher education complex including: Rutgers Newark, the New Jersey Institute of Technology, Essex County College, the University of Medicine and Dentistry of New Jersey, Seton Hall University Law School, and University Science Park, and the picture of an energized, vibrant city emerges. To accomplish its worthwhile work, the Newark Museum and its trustees have encouraged partnerships with the National Endowments for the Arts and Humanities, the New Jersey Historic Trust, the City of Newark, private donors, corporations and individuals who share its mission of 'Excellence and Equity.' Newark and New Jersey are fortunate to have such an institution in which the cultural traditions of America and the world are so beautifully revered and explained. John Cotton Dana wrote, and all who have followed him have pledged, 'I am convinced that the institution in my charge must see and feel and respond to the world's changing.' They have done just that very well.